The only girl in the small trio, she confidently steps forward to meet her friends at the crossroads of Sunset Horizons. 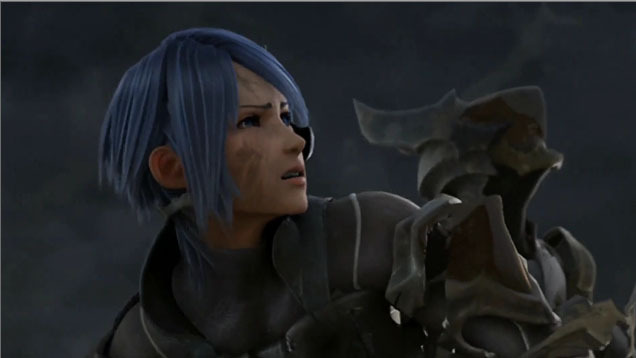 With her own Keyblade grasped tightly in her hand, she rushes into the fray to aid them in battle against the elderly mage and the dark soldier. With her knowledge and experience in the ancient art of magic and sorcery, she casts powerful spells in offense and defense to keep her enemies at bay and prevent her comrades from getting hurt. Despite her efforts, they appear to be powerless against their opponents, unable to stop him from summoning Kingdom Hearts. She can only watch as the intense power and light floods the battlefield, and hopes that three of them can only stay safe from the dangers ahead.